Take in the sunset and the mountains as you lounge, cook and dine on our expansive, 30 x 26 covered outdoor living porch with wood-burning fire place, propane gas grill and 14-foot custom dining table. 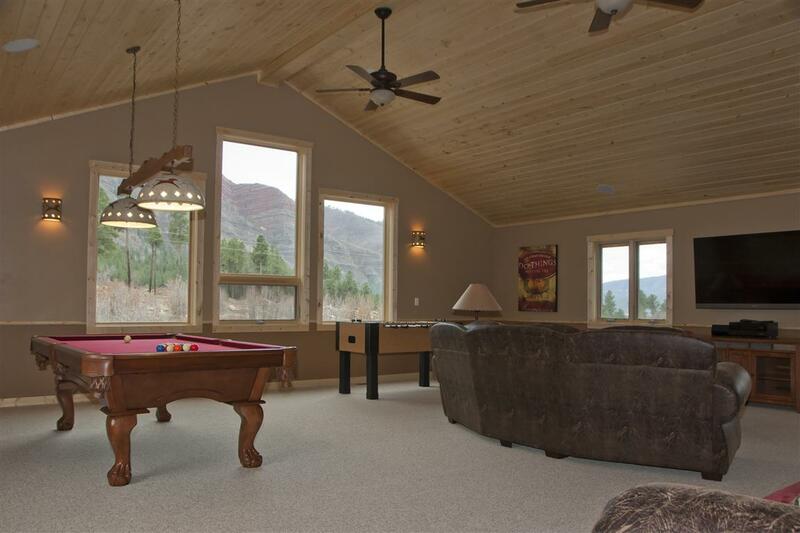 On the opposite side of the house off the kitchen, a roomy back deck and play area take advantage of red cliff views. Our ten acres of open land allow plenty of room to roam, and CR 250 is the most popular biking byway through the valley. 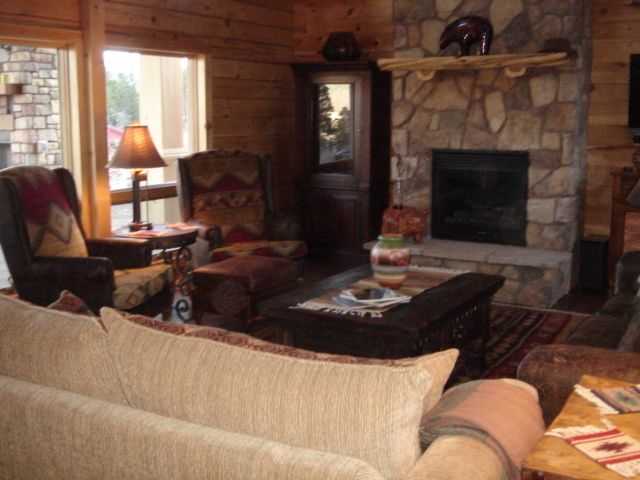 You are within 2-3 miles of the Bar D Chuckwagon and Western Stage Show; Dalton Ranch Golf Club and restaurant; an upscale shopping area and Trimble Hot Springs Spa. 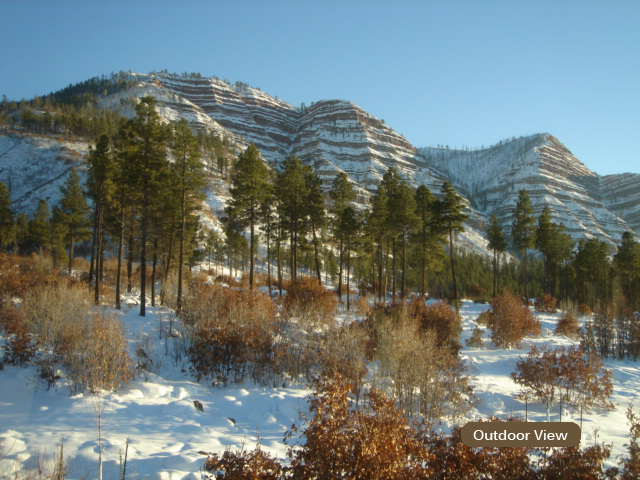 You are only ten minutes from the city of Durango to the south and all it has to offer; and about twenty minutes from Purgatory ski area and Durango Mountain Resort to the north. A large, airy great room (living/dining/kitchen) fills the entire center of the main level, with timber frame ceilings and striking views to the south (red cliffs) and north (Animas River, upper valley, Engineer Peak and more). The great room sitting area includes a comfortable queen sleeper sofa, gas log fireplace and large Sony flat-screen HDTV. The spacious, well-equipped kitchen is convenient to the front living porch and the back deck. 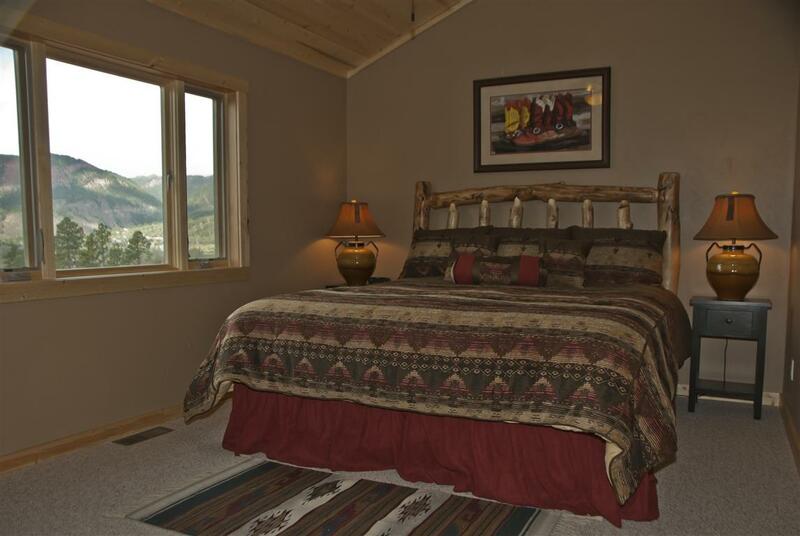 Two king master bedroom suites (one with gas log fireplace) flank either end of the main level, each with HDTV, private decks and gorgeous views. Two queen bedrooms and a shared bath complete the first floor, along with an attached two-car garage. 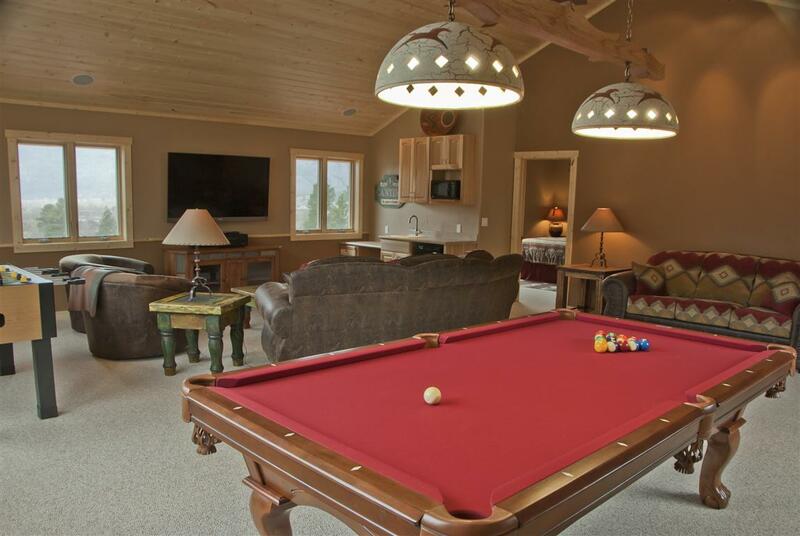 Relax and play in our 30 x 30 game room with 14-foot vaulted tongue-in groove ceiling, pool table, Foosball, large Sony flat-screen HDTV with 6-speaker surround sound and built-in wet bar with computer desk. Large windows on three sides frame wide-open outdoor scenes, in particular, the stunning red cliffs. The media area includes plush curved sofa, two barrel swivel chairs, Blu-Ray DVD player and I-Pad docking station. A separate queen sleeper sofa completes the furnishings. 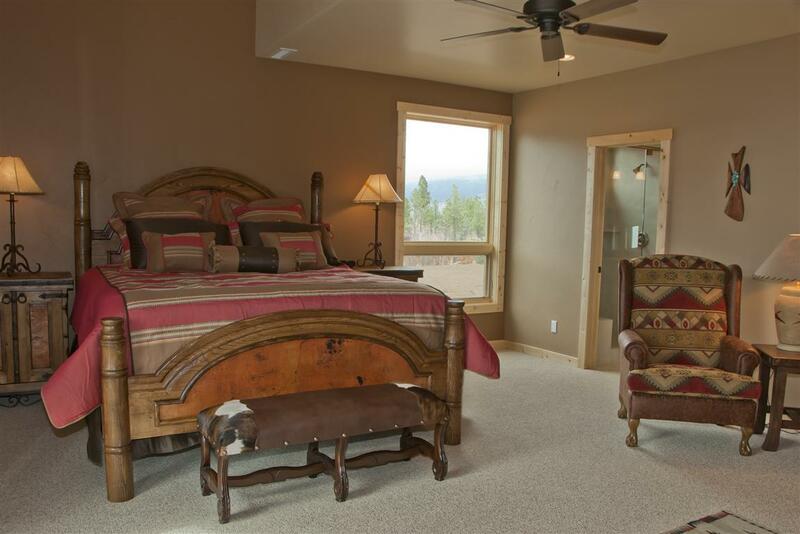 Upper floor sleeping/ exercise – A third king bedroom and attached bath is situated off the game room. The combination bunk room and exercise room has a twin-over-full bunk bed and futon. 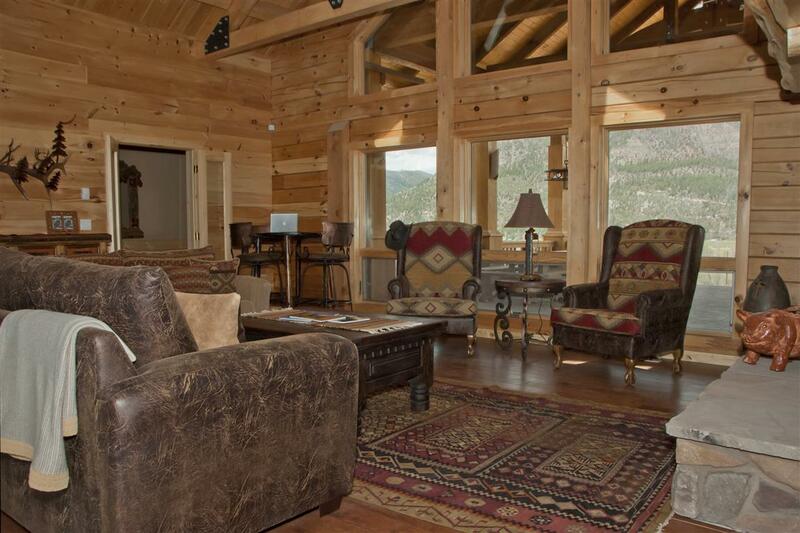 A treadmill and elliptical machine flank two vaulted windows with a spectacular vista of the upper Animas Valley, Engineer Mountain and the peaks beyond. Four can sleep comfortably in the bunk room, which has a wall-mounted Sony HDTV and hallway access to the bath located on this level.